Where do I use my Tokyo Laundry voucher code? 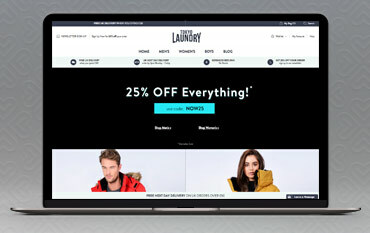 Browse our website to find the latest bargains, copy a code and click through to Tokyo Laundry. Start filling your basket with your goods and go to ‘Checkout’ when ready. 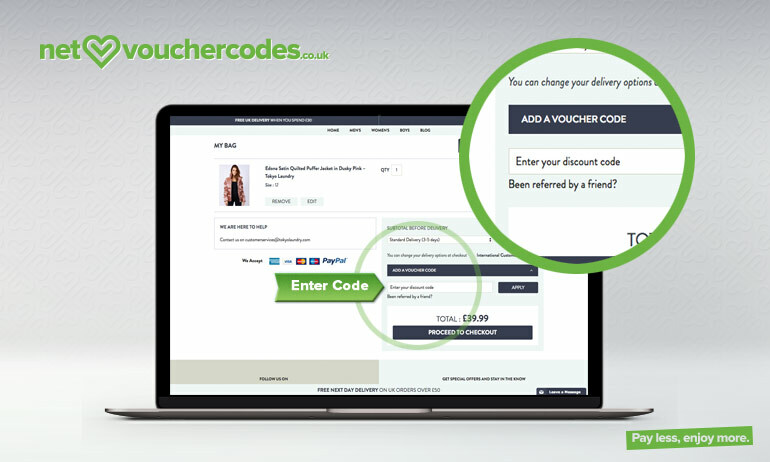 Paste your code into the ‘Voucher Code’ box and click ‘Apply’. Continue to the payment page and choose your delivery option. You can then complete the transaction. 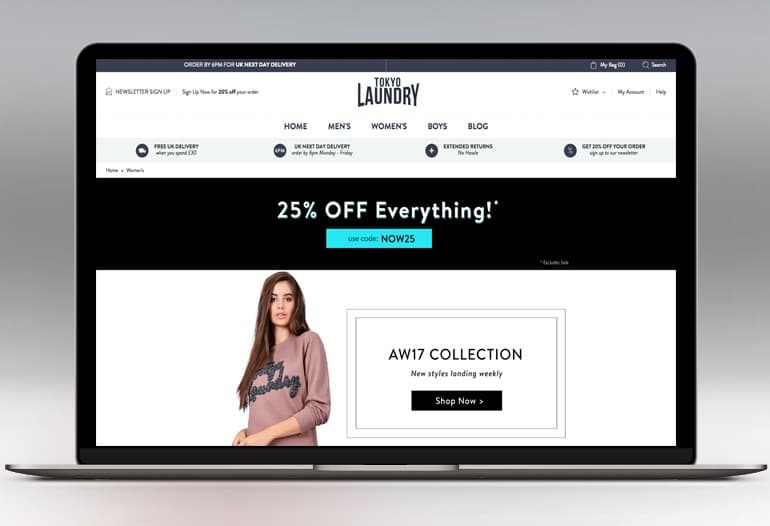 "Sign up to Tokyo Laundry today and grab 20% off your first online order! You will also have all the latest news and deals delivered straight to your inbox." With comfort and casual at the forefront of their clothing collection, you can expect stripped back, simple fashion taking precedence at Tokyo Laundry. This brand may not be high fashion, but casual style doesn’t mean you have to compromise on the latest trends. Uncover this season's latest styles whether it’s knitted jumpers, super soft feel t-Shirts, hoodies & sweatshirts, skinny joggers, boxers and underwear and much more. You will be amazed at what you can get for your money at Tokyo Laundry. If you simply don’t want to spend a fortune on designer labels, you can recreate your own catwalk looks with the superb selection of celeb and high-end fashion inspired collection at Tokyo Laundry and revel in the knowledge you haven't broken the bank in the meantime. Stocking men’s and women’s wear alongside a huge array of underwear including men’s boxer shorts and women’s nightwear and accessories, Tokyo Laundry cover almost everything your casual wardrobe is looking for. Get inspired by the by browsing through the latest blog post featuring all this season’s top picks and helpful advice on the latest casual fashion trends. Being on top of the style game doesn't have to come with an exuberant price tag so start browsing Tokyo Laundry today and see for yourself just what looks you can create for a fraction of the designer prices. It’s no secret that a handful of fashion retailers fail to adhere to workers rights and adopt an ethical manufacturing process, but you can rest assured that Tokyo Laundry takes their ethical sourcing extremely seriously. Staff at Tokyo Laundry work in the UK and overseas to improve the working environments of staff and improve production facilities so the company achieve the highest standards for suppliers and customers alike. So, next time you visit Tokyo Laundry, you can shop with peace of mind! Don’t spend a fortune when you next shop with Tokyo Laundry online. We know just how much you like to add new staples to your comfort clothes collection which is why we feature a wide array of money-saving discount and deals on our site so that you can pay less and enjoy more. Fill your online basket up today on all your favourite comfy casuals at Tokyo Laundry and add one our Voucher Codes listed on our page at the checkout and see the price drop before your eyes. We’re all about helping you grab a bargain where you can online here at NetVoucherCodes, so get savvy when you shop today! If your ideal weekend is spent cosying up on the sofa in your loungewear, the Joggers & Hoodie Deal over at Tokyo Laundry would make the perfect wardrobe staple for you! Combine a super soft hoodie in a range of popular colours with a pair of matching joggers or mix it up with a colour combo. Use a Tokyo Laundry Discount Code to gain huge savings off your next purchase and your weekend outfit could be a lot less than you thought! So whether it’s a Netflix marathon or a relaxed movie and takeout night. The hoodie and joggers deal at Tokyo Laundry has got you covered. Men can never have too many pairs of boxer shorts and the extensive collection at Tokyo Laundry means they will never have to run short. The elasticated, branded waistband is spot on trend for those men whose jeans hang low and you can choose from and range of bright colours too. Whether you’re gifting someone close to you or buying for yourself, there is a wide selection of styles and sizes to suit everyone's preference. These boxers are sure to make a statement so shop today and add a Voucher code to your order at the checkout and pay less for your goods courtesy of us here at NetVoucherCodes. If you’re unhappy with your purchase from Tokyo Laundry, you may return or exchange your item within 14 days of it being delivered. It will need to be in its original condition before returning. For information on how to return your item, see here. Alternatively, get in touch via their online contact form here.